No sooner did I write a review of Ghost Bath's LP of last year, the one-man show behind the band, Wúmíng, turned out a second. I liked Funeral a lot, and many of its strengths, refined in some different directions, are on the new one, Moonlover. In his usual cheerful manner, the gentleman supplied a "recently found note" with a fantasy of how his project's name came about, in which he witnesses a suicide by drowning, all to the sound of (what else?) kickass post-black-metal. I don't believe I'd be quite as happy to watch someone kill themselves to the sound of Moonlover as his protagonist is, but it was a great soundtrack to this week's round of work in front of the computer. After Sleeping Fields, an intro instrumental that is beautifully done in the manner of some of the little instrumental riddles on his last album, we get Golden Number, my favorite track. It starts with some very melodic black metal and suddenly gets melodic to the point at which it owes more to Iron Maiden and its followers partway through than to any black metal group I can think of. Like Funeral, the production is magnificent, with such beautifully precise, well-done drumming (or maybe drum programming) that it stands out on its own. Wúmíng's screams of despair and agony are also similar to the last album, but his penchant for keyboards doesn't hurt this one at all when he indulges in a miniature piano solo at the end. Happyhouse isn't quite as good, but still quite expressive. Needless to say, this is not a particularly "happy" song -- "doomy" would be a better way of putting it, with slow, smooth riffs that change up languorously to the sound of screams. Wúmíng puts a lot of effort into keeping this one interesting, and even though it drags from time to time, he pulls this off pretty well, taking some time off for another of those silvery guitar interludes he likes to do: Beneath the Shade Tree, which sounds even better than the ones he had on Funeral. The Silver Flower is also a "nighttime"-themed instrumental, now with crickets and night noises under what is primarily guitar but which has some keyboard synth underlying it, until its second part, which grows more ominous until the metal starts back up again in a marching processional. It doesn't stay slow for long; backed by a razor-sharp lead guitar, it cranks up to a fast-trotting beat that is quite a relief after all the quiet parts. Death and the Maiden, which finishes off the album, is faster still, keeping a similar song structure with harder, faster black metal stylings of tremolo picking and double-kick blasts that abruptly end with the same theme from The Sleeping Fields. 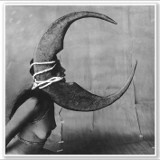 Moonlover proves that Ghost Bath's first LP wasn't a one-off. There are still some indulgent portions on there, but the sheer musicianship and songwriting attention of the guy behind this overcomes a lot of the growing pains of his sound. After a second album with a lot of the same elements, I'm still quite impressed with it.